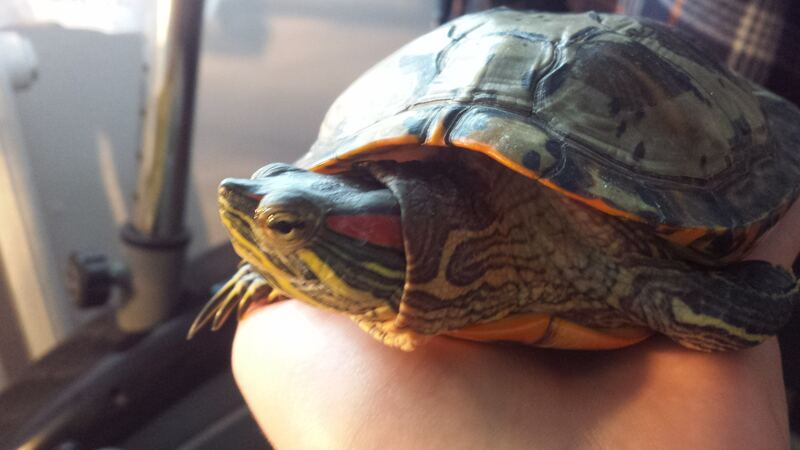 Redearslider.com :: View topic - Are my turtle eyes healthy or swollen? Urgent Care :: Are my turtle eyes healthy or swollen? Posted: Mon Nov 27, 2017 3:42 pm Are my turtle eyes healthy or swollen? I honestly cannot tell myself. Water is crystal clear, he has his he heat bulb, he is active and eating. Posted: Tue Nov 28, 2017 1:25 am Re: Are my turtle eyes healthy or swollen? They look normal to me. Are they a bit red ? I can't tell on the pics. Posted: Tue Nov 28, 2017 4:01 am Re: Are my turtle eyes healthy or swollen? They are a tiny bit red on the very edges of the eye but it's really hard to notice so I am not sure if it's something to be concerned about. Posted: Tue Nov 28, 2017 5:53 am Re: Are my turtle eyes healthy or swollen? That's what I thought I saw on the first pic. Well first of all have you checked your water parameters ? Could you share it please ? Most of the time when a turtle have something with their eyes it's related to the water quality. For how long have you had him ? Did you change anything in the tank recently or changed the water source ? Posted: Tue Nov 28, 2017 7:32 am Re: Are my turtle eyes healthy or swollen? If you live in US water companies by law must report what's in the water , see what you "are starting out with". Something may be irritating them. Do you use water conditioner and what brand ? Some are bad for turtles epically any that uses sodium thiosulfate ! Use search box for info on water conditioners. I do not use any chemicals But I use carbon to remove any toxins or chemicals in the water more natural. Eyes from what I can see in photo look ok , may be rubbing them more since early signs of skin shedding. Out the water hard to see but when in the water it shows up better. The shell is already in early shedding stage. Don't try to help scutes off that can cause damage let it happen on it's own. Does not happen over night just give it time for the keratin layer to come off on it's own. 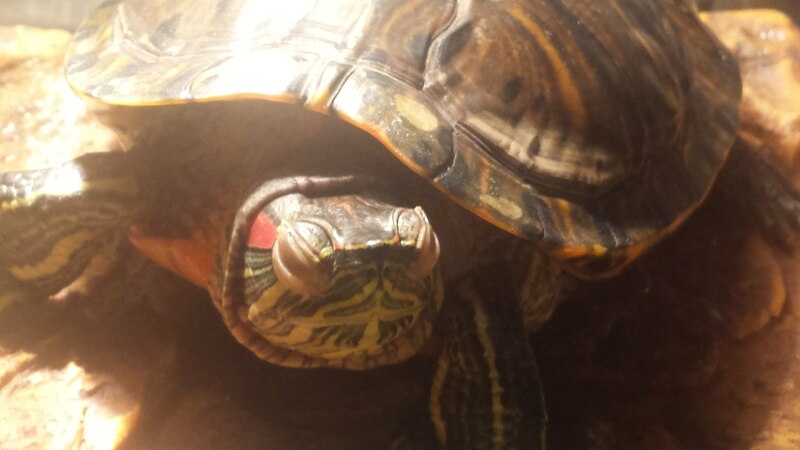 Posted: Tue Nov 28, 2017 10:44 am Re: Are my turtle eyes healthy or swollen? PokePony wrote: That's what I thought I saw on the first pic. I have him for over 10 years but only recently I moved and changed a lot stuff in his tank. Water is relatively fresh and crystal clear. 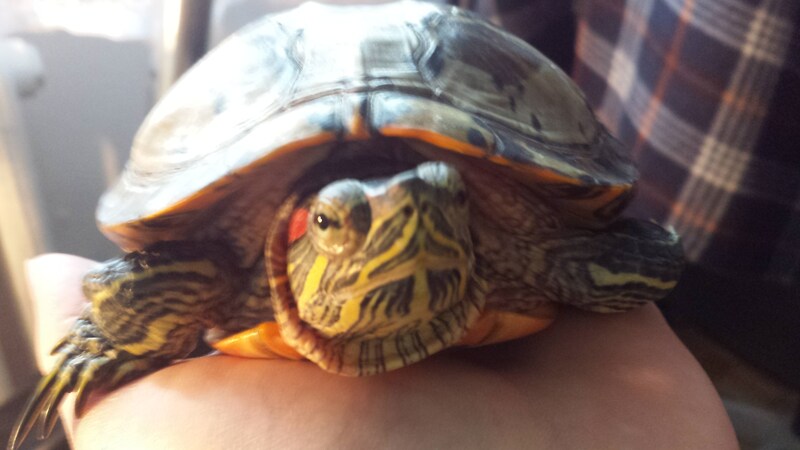 I used Tetra ReptoSafe to make it safe for the turtle. Yes, his skin was shedding recently and he was rubbing his eyes sometimes. I am not trying to pull off any scutes and yes he is losing them now, it's very visible when he is dried off. Posted: Tue Nov 28, 2017 12:24 pm Re: Are my turtle eyes healthy or swollen? If you have had him for ten years and never had trouble then I doubt it would be chlorine of something like that. I don't know about any of the conditioner and other things for tanks because my water is already ideal for turtles as it comes (the perks of living in a village in a small country). Maybe your turtle hit himself somewhere ? Check on its eye for a couple more days to see if it doesn't get worse. If it's only a scratch or something like that it should look better or completely disappear in a few days. Posted: Tue Nov 28, 2017 1:25 pm Re: Are my turtle eyes healthy or swollen? Village life adopt me please. I know who to grow veggies year round. Just a note : some city's do change thing at times. Before chloramines came about in US most cities put so much chlorine in due to it evaporating fast that residents complained. Then came chloramines in the US , turtle trade had to adjust. Conditioners had so much in them to counteract the added chemicals most long timers started using carbon and still to this day. By me they switch to a higher % of chlorine in winter because it's cheaper and in summer more chloramines than chlorine. Kind of like gasoline has a winter mixture and a summer one. Some city's just started using chloramines. Reason I brought it up is most old timers try our best to keep any chemical out our tank so we have control of it. Some may not know this and think water is water so I pass this info along. Lots of homework in this hobby. Type water conditioners in search box on this forum and see all the info there. Even look at some of the "MSDS"'s Material Safety Data Sheets ! That's why I stop using chemical conditioners a good while back and switched to carbon. But then that's me , it's your call for your system. Homework for me never stops.